Said every camp staff ever. Except, do our staff really know what we mean when we say that? A few years ago, I had just taken over a shiny new director job, facilitated training session, went over all of our policies, taught best practices… everything went great. About half way though the first week of camp, I was bopping around to tables to say hi to the campers during a meal and I noticed that one staff member was sitting there without anything in front of him. Again, he told me “no”. I said I’d stay at his table while he went and got a plate, and he informed me that there was none left. But there had been tons of food, there was no way that there wasn’t enough for everyone. I checked with the other tables, to make sure everyone had enough to eat. There was one other counsellor who hadn’t gotten any, but it seemed that everyone else not only had enough to eat, but had second helpings (in some cases thirds!). I asked if I could speak to the two guys who hadn’t gotten any food, and when I asked what had happened, these two returning counsellors looked at me like I had five heads. And that’s when it clicked, their interpretation of “campers come first” was that campers had to be bursting at the seams full before counsellors could get food. These guys were returning staff, and the previous summer that’s how they made sure that they were “putting their campers first”, I don’t know if their previous director was misinformed or unaware, but I know that when I referenced our campers come first philosophy in the manual during training, they nodded along so I made an assumption that they “got it.” Never assume. I explained to them that all of their campers should have their first serving before the staff starts to serve themselves. But that everyone should have at least one serving before people start going back for seconds. Then shooed them into the kitchen to find a quick bite. There have been other times that staff have pushed themselves because they wanted to put the campers needs first, or at least they thought they were putting the campers needs first, like staying up really late so they could make their campers the BEST end of session awards EVER. Which in theory, is great, but in practice not so much. If you’ve been around this blog for a while, you’ll know that I’m a huge proponent of self-care. And it’s really, really, hard for you to meet someone else’s needs when you haven’t even met your own. Will this choice help me better support my camper’s needs? Am I being a good role model for my campers? Will this choice (activity, etc.) benefit my campers (will they learn something)? Will my campers have a better experience because of this? If the answer is “no” to any of those questions, then they’re not putting their campers first. If staff are causing themselves to be tired or hungry, they’re likely going to answer “no” to a few of these questions. They’re not going to be able to support their camper’s needs because they’re going to be tired since they’re not giving their body the fuel it needs. They are not being a good role model, at all. Campers look up to staff so much, if you’re sitting with an empty plate in front of you, you’d better believe they’re going to take notice – and good luck trying to get them to bed at night when you’ve been dragging your feet like a zombie all day… they will totally call you out on late nights. Staying up super late to finish a project (in this case camper awards) isn’t going to teach your campers any beneficial skills, but do you know what would? Seeing you manage your time wisely, OooOoHHhhhhh!!! Time management!!! And even though you might argue that staying up late to make awesome awards will help your camper’s experience because they’ll have something great to take home and remember camp with, I would argue that the chance that you’ll be grumpy, tired, not quite giving 100% will outweigh any good you may have done. Because do you know what’s BETTER than having a fancy shmancy award to take home? Having some super awesome memories of alert, happy, enthusiastic counsellors who wanted to spend time together. I 100% support the campers come first philosophy, I will go above and beyond to make sure my campers are having an amazing experience, and encourage my staff to do the same – but I also want us all to find balance and to create safe and happy environments for both campers AND staff. 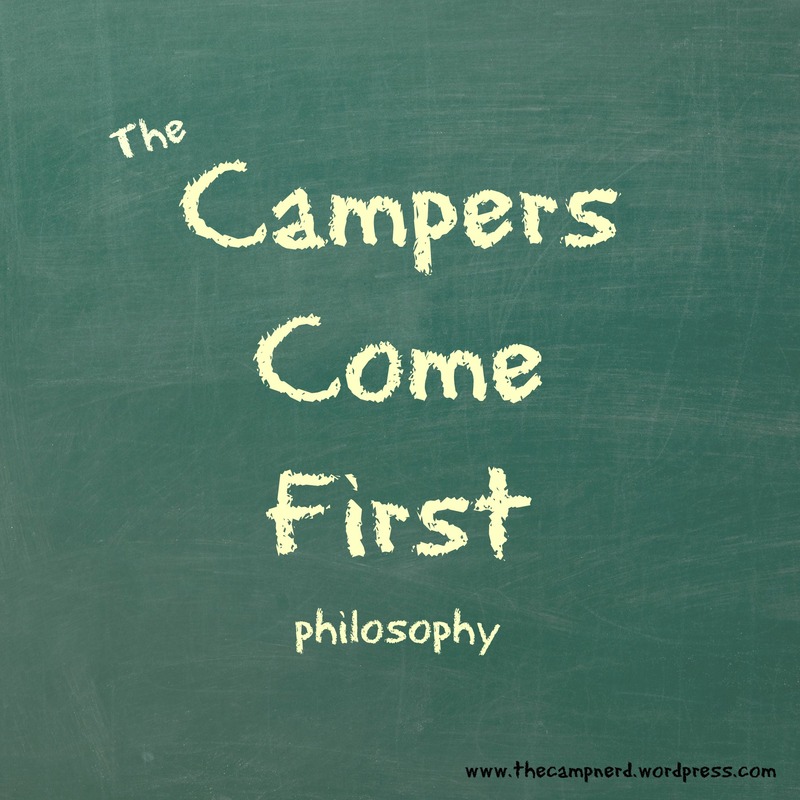 How does your camp interpret ‘campers come first’? Tell me about it in the comment section below. And don’t forget to say hi on twitter, FB, or Pinterest. Well said…er, written. It’s like what they tell parents to do in an airplane when the oxygen masks drop. The adult puts there’s on first and then the child’s, because if the adult passes out, they won’t be able to help the child get their mask on.